Before we start I would like to inform you that the information from this section came from the AWS Welding Handbook Volume 2 Welding Processes. I would highly recommend that you purchase this Handbook, it will prove itself to be very useful and will most likely gaurentee that you will be getting correct information. There is also information that I have put in from my experience with this process. What is Gas Metal Arc Welding? Gas Metal Arc Welding (GMAW) is a process that has a continuous feed of an wire electrode where there is an arc produced between the wire electrode and the weld puddle. The arc is shielded with an gas that is either inert of reactive. The original term for Gas Metal Arc Welding was MIG, which stood for Metal Inter Gas. This was because originally the process was being used primarily in the welding of Aluminum with an inert shielding. How can the Gas Metal Arc Welding Process be implemented? The Gas metal Arc Welding Process can be used in the Semi-Automatic and the Automated welding methods. Semi-Automatic welding is where a welder performs the weld and the Filler Material is feed automatically at a predetermined speed. This form of welding allows for the welder to focus on controlling the puddle. Automated welding is where the weld is performed by a mechanical device (Robot Arm, etc...) which has a technician that runs the device. What type of Materials can be welded with GMAW? The GMAW welding process can weld a wide variety of materials ranging from Carbon Steels, Titanium, Copper, Aluminum and Stainless Steels. 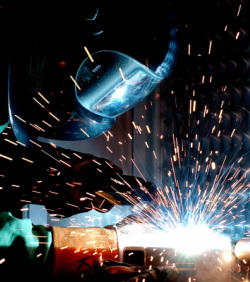 Each type of material has to use a specific Filler Material and procedure to ensure a proper weld.